A few weeks ago I discussed route US-10, noting that it is one of only two US-numbered highways with a ferry connection: the other is US-9, between Cape May, New Jersey and Lewes, Delaware. Highway US-10 used to officially be two separate parts, but in 2015, the ferry S.S. Badger was officially designated as part of the highway. The S.S. Badger now actually has an image of a US-10 route sign on the ship! The ship began service in 1953 and was only 10 years old by 1962, so we could have enjoyed it then in its glory years. The S.S. Badger is the largest car ferry ever to sail Lake Michigan and is also the only coal-fired steamship still in operation in the United States. While the ship was built by the C&O Railroad primarily to transport railroad freight cars, it also ferried passenger cars and had superior passenger accommodations. It was completely refurbished in 1991 with a buffet-style dining area, private staterooms, and even a movie lounge so you can once again enjoy the cruise in comfort. All railroad car facilities were removed at that time. This week, as promised when I was in Ludington, Michigan, I will discuss the other end of the ferry journey in Manitowoc, Wisconsin. I was there this past summer, on a trip around Wisconsin. Highway US-10 currently runs from Fargo, North Dakota to Bay City, Michigan. In 1962, it continued south to Detroit, Michigan, overlapping with our US-23 trip for 30 miles. The route also used to run about 1700 miles farther west from North Dakota, ending at Seattle, Washington. Beginning in 1969, for about the next 20 years it was shortened west of Fargo as each segment of I-90 or I-94 freeway was completed. Manitowoc is also the end of another US-numbered highway, US-151, which runs 337 miles to Williamsburg, Iowa. In 1962, it ended in Cedar Rapids, Iowa, but was extended in 1985 to reach the interstate freeway south of that city. Back in 1962, highway US-141 also ran through Manitowoc, on its way from near Walton, Michigan south to Milwaukee, Wisconsin. That route was shortened in the 1980s and now has its southern end at Belleville, Wisconsin. The history of Manitowoc includes Great Lakes shipbuilding and beer brewing, and both are represented in the attractions we could see in 1962 and today. Wooden ships were built here as far back as 1847, with expansion into steel-hulled ships later. Ships ranging from schooners, clippers, fishing boats, personal pleasure craft and even tankers, naval landing craft, and submarines have been built here. One of the few local attractions that is too new for our purposes is the Wisconsin Maritime Museum, which was founded in 1970. In addition to their museum, they host the World War II submarine USS Cobia, which was built here and is now docked in the water adjacent to the museum. The Burger Boat Company is the last boat builder in Manitowoc and is a builder of custom-designed, hand-built pleasure yachts and commercial vessels. The company was founded in 1863 and began producing welded steel yachts in 1938 and welded aluminum craft in 1952. Today, about 350 employees build an average of three yachts a year. Another reminder of the city’s shipbuilding past is the Manitowoc Company, known world-wide for the industrial cranes they manufacture. Though they no longer build cranes here, in 1962 we would have seen plenty of activity at the company. The company was founded in 1902 as a shipbuilding and ship-repair company. 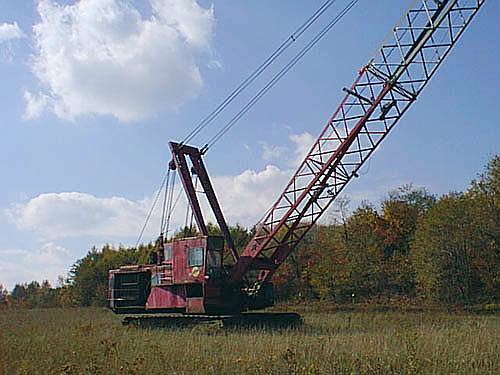 They began building their most well-known products, lattice-boom cranes, in the 1920s. Because of this diversified product line, Manitowoc was the only Great Lakes shipyard to survive the financial strain of the Great Depression in the 1930s. Because of their shipbuilding background, they were chosen by the US Navy to build 28 submarines, including the USS Cobia, during World War II. The company built and repaired commercial and military ships at yards in nearby Marinette and Sturgeon Bay, Wisconsin and Cleveland, Ohio until 2008, when the marine division was sold to an Italian company. But they completed the recent refurbishing of the S.S. Badger before then, as they had built similar ferries years earlier. Another place you may have seen the Manitowoc name while traveling is at motels. Manitowoc Foodservice is a sub-division of the company that produces ice machines! The brewing industry is represented both by the giant complex of malting silos once belonging to William Rahr’s Manitowoc Malting Plant, and in his legacy at the Rahr-West Art Museum. Rahr’s malting plant is now owned by Briess Malt & Ingredients Company, who bought it in 2011 from Anheuser-Busch. They had purchased it from Rahr’s company in 1962 and shortly thereafter, they painted the massive Budweiser bottle and cans on three of the barley silos at the east end of Washington Street. The Rahrs began selling malt to Anheuser-Busch in 1891. William Rahr began the malting plant in 1847 and it currently includes 40 buildings on 23 acres. About 2,700 railcars of barley arrive annually at the plant where the grain is processed into malt. Rahr family members brewed beer until Prohibition in 1920, but then focused the business on turning malt into cereals. Beer production did not resume when Prohibition ended in 1933. The Rahr family became very wealthy from the malt business, allowing Mrs. Clara Rahr to donate her 1891-1893 mansion to the City in 1941, to be operated as a museum and civic center. Today, it has become the Rahr-West Art Museum, which houses a varied permanent collection including works by Pablo Picasso, Joan Miro, William Bouguerea, Georgia O’Keeffe, Mark Rothko, Andrew Wyeth, and Andy Warhol. The majority of art and historical artifacts are from the United States, including many by Wisconsin-based artists. I enjoyed the mix of art and historical artifacts displayed in period-decorated rooms. The museum is also where you can find a marker in the sidewalk of North 8th Street, commemorating the event of September 5, 1962, when a 20-pound chunk of the Soviet Union's Sputnik IV satellite crashed onto the middle of the street at the corner of Park street. A brass ring has been embedded in the pavement to mark the exact spot of the impact. A cast of the original piece was made and has sometimes been displayed at the Rahr-West Art Museum. The satellite was launched in 1960 and it appears an operator error caused it to move to an incorrect orbit, resulting in its breakup, destruction, and fall to earth. It is believed that the largest piece of the seven-ton satellite fell into nearby Lake Michigan. The recovered debris was analyzed by the Smithsonian Astrophysical Observatory, the Massachusetts Institute of Technology, Brookhaven National Laboratory, Los Alamos National Laboratory, Carnegie Institute of Technology chemistry department, and the Air Force Cambridge Research Laboratories before being returned to the Soviet Union. In a goofy celebration of the event, the city hosts Sputnikfest each year since 2008. The festival includes lots of wacky and tacky displays and event. Sputnik crash marker in front sidewalk of Rahr-West Art Museum, Manitowoc, Wisconsin. If you’re tired of the city, I recommend heading north to the edge of town. There, on the shore of Lake Michigan, is the lovely and restful West of the Lake Gardens. These gardens belonged to Ruth and John Dunham West, who began construction on six acres of quack grass and thistle in 1934. Ruth Dunham and a hired gardener hand-spaded those first six acres, planting windbreaks consisting of 70 Colorado spruce trees, which are still standing today. They also built their home here in 1934, known by locals as the "Shoebox Estate" because it was a rather flat, rectangular house showing the modern styles of Walter Gropius and Frank Lloyd Wright. Additions to the house continued into the 1950s, by which time Mrs. West had over 30,000 tulips in the garden planted in the gracefully sweeping beds you can see today. Back in 1962, we could probably only have visited the gardens during the annual West of the Lake Tulip Tea event, when it was open to the public. In the early 1960s, perennials were planted until a mere 13,000 tulips remained and by 1967, all the remaining tulips were removed. Today, West of the Lake Gardens is a place of spectacular color from May to October. The Wests’ fortune was made via the Manitowoc Shipbuilding Company, where Mr. West succeeded his father as president in 1957. The Wests also supported the Rahr-West Art Museum with millions of dollars for the construction of the exhibition wing and purchase of works of art for the permanent collection of the museum. After their deaths in 1989 and 1990, the Ruth St. John and John Dunham West Foundation has operated the gardens and has them open to the public during blooming season. Summer floral display at West of the Lake Gardens, Manitowoc, Wisconsin. One place I did not visit when I was recently in Manitowoc was Pinecrest Historical Village, operated by the Manitowoc County Historical Society. The society was established in 1906, largely as an effort to preserve local Civil War and pioneer history, but has grown into one of the most active county historical societies in Wisconsin. They began in the second floor of the local library, quickly overrunning the space. The society then moved into the Rahr-West Art Museum, then known as the Rahr Civic Center, in 1941. By 1949 they had overrun that space to such an extent that they filled nearly every room and restricted the use the building by other groups. Other groups then voted the society out of the building and they had to move artifacts into such as a vacant school building, which was vandalized, resulting in the loss or damage of many artifacts. The Manitowoc County Historical Society still held occasional exhibits in the Rahr Civic Center throughout the 1950s and 1960s, so we could have seen those. Today, they operate a 60-acre interpretive museum, Pinecrest Historical Village outside of town. The village is a collection of over 25 historic buildings with period furnishings from Manitowoc County's early settlers. The village property was acquired in 1969 and the first buildings moved in the next year. Manitowoc also has a small zoo with just under 200 animals, including black bear, bald eagle, cougar, lynx, Prairie dogs, and lots of birds. I enjoyed the bison. There is also an exhibit you don’t see at many zoos: the Fish Rearing Pond, where salmon are raised. The zoo was a project of Manitowoc County Fish & Game, which began it in 1935. That organization eventually turned over the zoo and the land to the city. I strolled around for about an hour and believe I saw it all. There are other trails within the adjacent park where you might even see wild deer. Silver pheasant at Lincoln Park Zoo, Manitowoc, Wisconsin. Some posibilities for a 1962-style lunch or dinner include the local A&W Drive-In or Beerntsen's Confectionary. Though A&W was founded way back in 1919, the current restaurant here was opened in 2009. As with many small towns, there was likely an older one here. They do set a nice atmosphere, with carhops still serving you on your car window and 1950s-1960s music on the jukebox. I’m a big fan of A&W’s chili cheese fries and root beer. Beerntsen’s Confectionary has been a local tradition since 1932, when Joseph A. Beerntsen founded Beerntsen's Candies. They still make hand-dipped chocolates and homemade candies. But what makes it a lunch or dinner stop is the old-fashioned ice cream parlor, with its original black walnut booths, candy cases, and arches, that serves sandwiches and soups. Beerntsen's sundaes are made with their own homemade ice cream and toppings. If you don’t need to stop and eat here, pick up some of their candies and chocolates that are still made using the same methods from over 50 years ago. They also still use copper kettles and wooden paddles with equipment that is irreplaceable due to advances in equipment technology and production. Well, I’m staying about 7 miles northeast in Two Rivers, Wisconsin, so I should be heading back along the lakeshore. The city is not on any US-numbered route and is a bit too far for my self-imposed limit of 5 miles for Roadtrip-'62 ™ 1962 sight-seeing. But I did stay in an old building: a house designed by Frank Lloyd and built in 1939. The Schwartz House, also known as Still Bend, is now rented out so you can experience living in a design by an American architectural master. It still has the original design features, with colored concrete first floor, no screens on the windows and no air conditioning, some very narrow halls and bathrooms, custom-designed wood trim, and high-ceilinged great room accessed from low-ceilinged entryways. It has been a very interesting experience and I’m heading back tonight to sleep in one of the bedrooms with a private, second floor balcony. Lake Michigan shore near Manitowoc, Wisconsin.